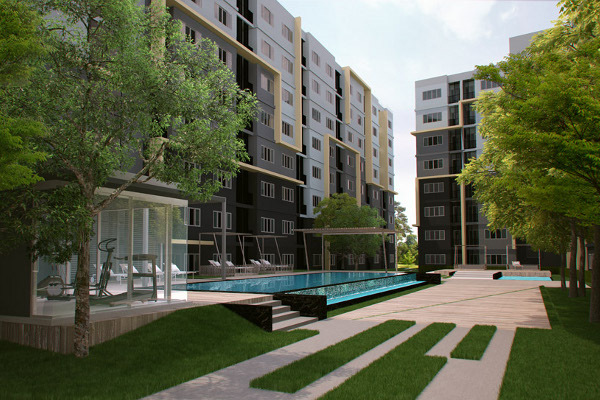 PHUKET: Leading Thai real estate developer Sansiri is about to launch its first project in Phuket, a condo development in Kathu, aimed at the Thai market. Computer-generated image of the dCondo development in Kathu. The B560 million project, consisting of three eight-floor buildings on a 70-rai site, will contain 556 studio units, each of 29 to 30 sqm. Prices will range from B999,000 to B1.4 million, depending on floor and view. Asked why the company was entering the Phuket market only now, executive vice president Suriya Wannabuit revealed that it did take a look at Phuket’s potential eight years ago, but decided to stay away. He said, “We looked at Kata with the idea of building a pool villa project. “But at that time Phuket had a problem about land holding and title dead. Some sites had more than one person claiming ownership. “We decided not to go ahead with the pool villa project until we had completed successful projects in Bangkok and we then returned to Phuket to survey the island again. The dCondo project that is to be built in Kathu is very different from the original pool villas plan, Based on successful dCondo developments in Bangkok, it is aimed firmly at the Thai first-home market. In addition to the three eight-floor blocks, the 70-rai site will have a green area, a fitness room and a communal swimming pool. Would-be buyers can see a mock-up apartment at the pre-sale event on October 15 and 16 at the dCondo site on Vichitsongkhram Rd.